American Products is a major regional supplier of precision custom metal stamping and fabrication. 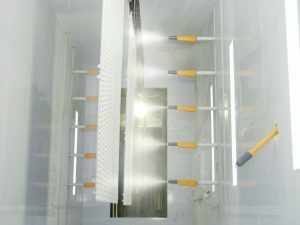 They also provide powder coating, product development, assembly, and packing services from their two Missouri locations. After a series of downsizing and new ownership issues, America Products was left with a mixture of equipment that was aging and inefficient. The powder booth was so cumbersome to clean, that it took three hours to do a color change. American Products needed an upgrade! After looking at various competitors’ solutions, American Products chose a new 12,000 cfm VortechPlus™ booth from Gema USA. They completed their upgrade with OptiGun-2AX™ automatic powder guns, OptiFlow™ pumps, OptiTronic Plus™ control units, a Chameleon™ Color Management System, an AutoTracker™ Programmable Logic Control (PLC), gun movers, and light curtain part recognition. “We went from a three-hour color change to twenty minutes with one operator,” stated Steve Smith. “Our powder recovery rate is at least 95%, we’re saving $20,000 a month in labor and scrap for reworks, and we’ve reduced our powder usage by about 30%. I wish we would have done this a long time ago!” American Products calculated a payback of 14 months; however, according to Steve Smith, the figure is really much lower due to the realization of savings in areas not included in the original payback formula.